When plans are cancelled at the last minute and you are left with a disappointed little boy… kites are always the answer. Even if it’s not particularly windy, there’s loads of fun to be had just running wild with the kite trailing behind you on the end of a string. 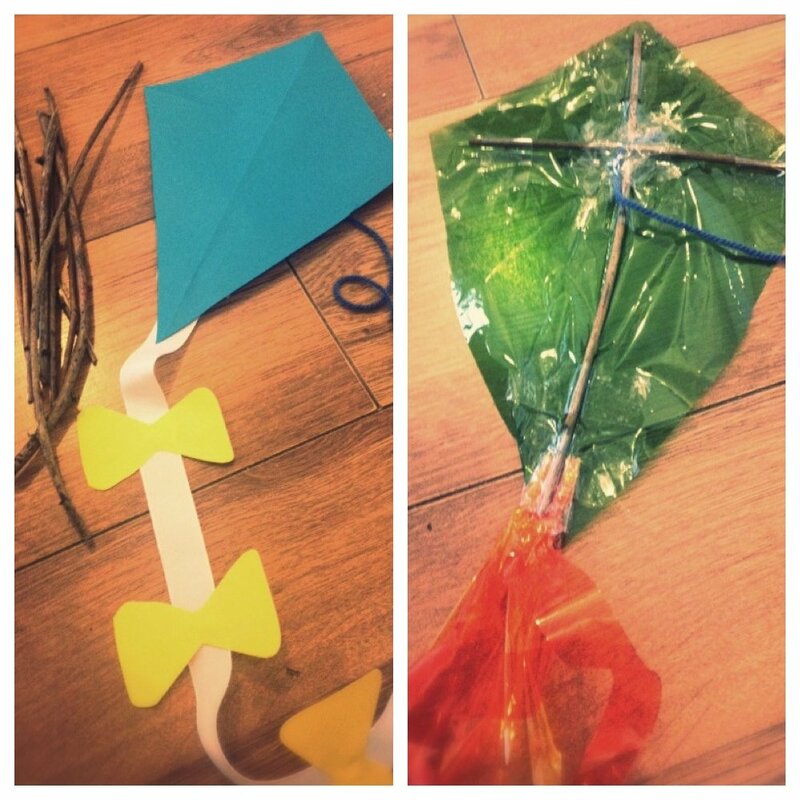 We made two kites – a nice breezy spring day kite and a rainy day kite… today we needed the rainy day kite. Don’t worry if you don’t have cellophane sheets you can make this kite just using an old plastic carrier bag. Obviously when using plastic bags – don’t leave small children unattended as it can be dangerous. a ribbon for the tail or some strips of cellophane/plastic for the rainy day kite. some scrap paper to cut out bow shapes. First cut the kite shape – simply fold the paper/plastic in half length ways and then make a fold horizontally around 1/3 from the top of the paper. Cut into a diamond shape. 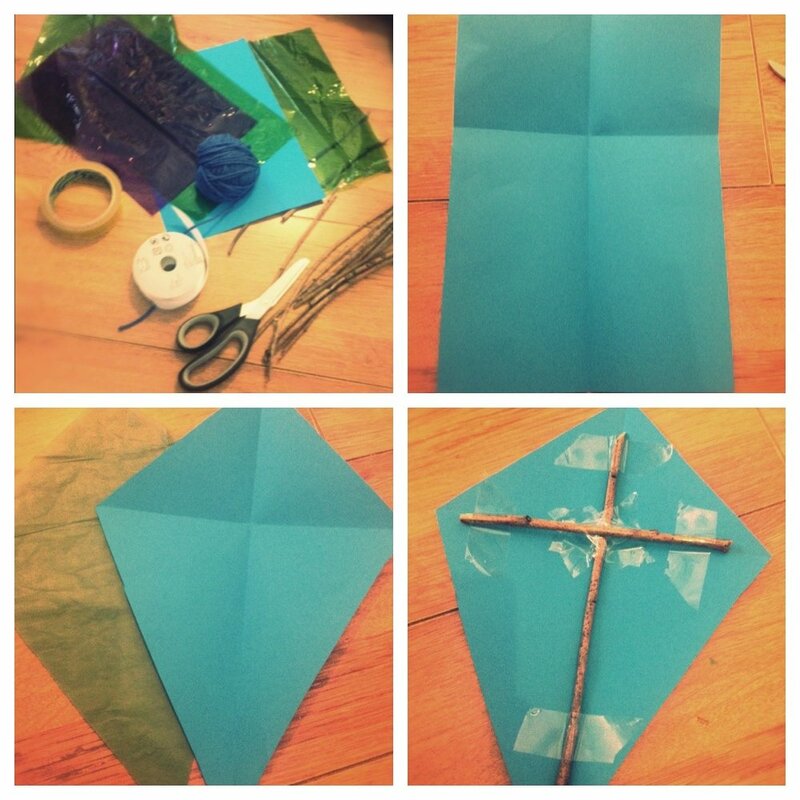 Using sticky tape attach two sticks to the kite shape – one along each fold. Next we taped on the ribbon tail and bows/cellophane strips for the rainy day kite. Tape the string to the cross over section of the twigs – use loads of tape so it doesn’t come free. That’s it! Go run around wild and fly your kite. You can decorate your kites and put lovely stickers all over them but we didn’t have time today – we needed to get outside and run around! Things to do with kids UK – especially when it’s raining – we’ve got it covered!